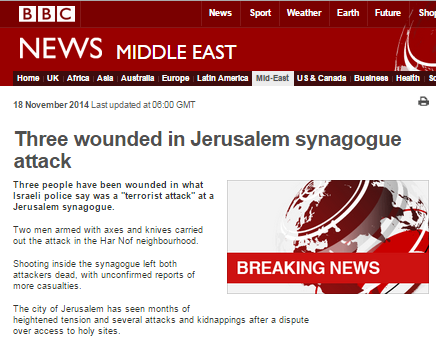 As documented here extensively, the BBC adheres to that guidance when reporting on terror attacks against Israelis. However when reporting on terrorism in some other locations, the BBC displays markedly less commitment to avoiding “value judgements” and maintaining “consistency”. As readers may recall, the BBC made appropriate use of the word terror in its 2015 reporting on the second of those attacks. However when BBC Watch submitted a complaint concerning the inconsistency between that reporting and previous coverage of a terror attack at a synagogue in Jerusalem, the BBC claimed that the two attacks were not comparable and described them as “very different” stories. When BBC Watch submitted a follow-up complaint we were informed that the BBC was not prepared to engage in any further correspondence on the matter. This latest headline once again demonstrates that the BBC does not apply its own editorial principles in a uniform and consistent manner. When the corporation wants to use words such as ‘terror’, ‘terrorism’ or ‘terrorist’, it does. When it wants to make “value judgements”, it does and in fact what dictates the BBC’s choice of terminology is “a political position” of precisely the type it claims to try to avoid. Four days after he attended the controversial wreath-laying ceremony in Tunis in October 2014, Jeremy Corbyn had an article published in the ‘Morning Star’ in which he described that event, an additional one and the conference which had preceded them. In other words, Corbyn was fully aware of the fact that members of at least two proscribed terrorist organisations – Hamas and the PFLP – were at that conference and was perfectly happy to share a platform with them. However, when The Times published a photograph of Corbyn standing next to PFLP leader Maher al Taher at that wreath-laying ceremony, the BBC’s domestic audiences heard reports which made no mention of Corbyn’s 2014 article in the ‘Morning Star’. The PFLP was not merely “linked” to the Har Nof terror attack (which the BBC refrained from describing as such at the time) in which six people were murdered: it claimed responsibility for it. Once again BBC audiences were not told that the context to Corbyn’s statements is the fact that the 1985 Israeli airstrike on the PLO HQ in Tunis came in response to a Palestinian terror attack against Israeli civilians in Cyprus. Once again the BBC refrained from informing audiences that the PFLP has not just “been linked to” the Har Nof attack but actually issued a formal statement stating that the two terrorists belonged to its ranks. The same omission appeared in an article published on the BBC News website’s ‘UK Politics’ page on August 16th under the headline “Jeremy Corbyn ‘unaware’ of militant group figure“. “Jeremy Corbyn has said he did not know that a man he stood next to at a wreath-laying ceremony was a senior member of a militant Palestinian group. Maher Taher, of the Popular Front for the Liberation of Palestine (PLFP), was pictured alongside the Labour leader at a 2014 event in Tunis. The PLFP was later linked to an attack on an Israeli synagogue. The US and EU consider it to be a terrorist group. Readers of that report also found the quotes from Corbyn promoted in the above two news bulletins. “I don’t share platforms with terrorists,” Mr Corbyn said. “I don’t believe in killing people. The report went on to provide readers with a link to a profile of the PFLP which was first published by the BBC following the Har Nof attack. Nearly four years on, that profile – previously discussed here – is still illustrated with an inaccurate photograph and has still not been updated to reflect the correct number of victims murdered in that attack. It is therefore unsurprising to see that this article also gives readers an inaccurate account of the number of people killed in that terror attack. As we see, while domestic BBC audiences saw and heard multiple uncritical amplifications of Corbyn’s denials concerning Maher al Taher and his disingenuous claim that he does not share platforms with terrorists, the BBC made no effort to inform them of Corbyn’s October 2014 ‘Morning Star’ article in which he clearly stated that he had appeared at an event together with representatives of two proscribed terrorist organisations. 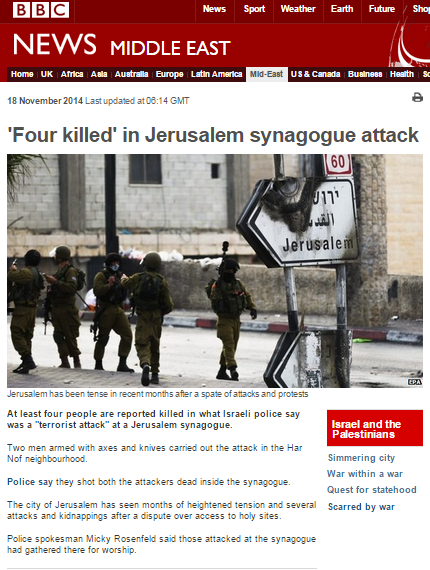 Following the terror attack at the Kehilat Ya’akov Synagogue in the Har Nof neighbourhood of Jerusalem on November 18th 2014, the BBC News website produced a profile of the organisation with which the two terrorists were affiliated. “It was also not clear how involved the PFLP leadership had been in the attack in November 2014 that saw two members of the group armed with axes storm a synagogue complex in West Jerusalem and kill four rabbis in the middle of their morning prayers. In fact, five people (four worshippers and a policeman) were killed during the attack and one additional victim succumbed to his wounds a year later but the BBC’s article has not been updated accordingly. Readers of the profile are not informed that the PFLP is defined as a proscribed terror organisation by the United States, Canada, Israel and the EU. NGO Monitor recently produced a report concerning the financial support provided to various NGOs linked to the PFLP. Some of those NGOs have been directly or indirectly quoted and promoted by the BBC in its Middle East coverage – for example Addameer, Al Haq, Defence for Children International – Palestine and of course the PCHR, which received particularly extensive exposure during the 2014 conflict between Israel and terror organisations in the Gaza Strip and which was one of the sources behind the casualty figures amplified by the BBC at the time. “A top operative of Hamas and news media favorite named Ghazi Hamad has recommended “small stabs to all parts of Israel” as a strategy against the Jewish state. Hamad is currently the deputy foreign minister of Hamas, the U.S.-designated terrorist group that rules the Gaza Strip. According to the Middle East Media Research Institute (MEMRI), a non-profit organization that translates Arab and Persian media, Hamad suggested a war of attrition against Israel in an Op-Ed he wrote for the Alwatanvoice.com, an online Palestinian news outlet based in the Gaza Strip. Ghazi Hamad has also been a fairly frequent BBC interviewee. For example, he appeared on the self-described “hard-hitting flagship news programme” ‘Hardtalk’ in May 2011 and in July 2012. In August 2013 Hamad was quoted by Yolande Knell in an article about Egypt’s closure of the Rafah crossing. “Cairo has repeatedly accused Hamas of interfering in Egyptian affairs and has accused Palestinians of supporting Islamist militants in the increasingly restive Sinai region. “They have a plan in order to distort the image of Gaza in order to start propaganda and media campaign against Gaza, against Hamas, in order to show Gaza is like a devil and Hamas is like a devil,” Mr Hamed [sic] said. BBC coverage of the terror attack at the Synagogue in Har Nof in November 2014 included an interview with Hamad in which he was given an unchallenged platform to promote inflammatory falsehoods, including the baseless accusation that “settlers” killed a Palestinian bus driver who committed suicide. “Doucet then gets Hamas’ Ghazi Hamad on camera but, instead of posing any incisive questions about his organisation’s responsibility for the conflict and its aftermath, she merely provides him with a stage from which to promote the usual propaganda unhindered. In March 2016 Yolande Knell once again interviewed Ghazi Hamad on the topic of Hamas collaboration with the branch of ISIS active in the Sinai Peninsula. Clearly the BBC’s use of Ghazi Hamad as a source of information on that particular issue and many others has not only done nothing to contribute to meeting its remit of building an “understanding of international issues” but has actively hindered the achievement of that aim. The January 10th edition of the BBC World Service radio programme ‘Newshour’ included a discussion (from 44:43 here) about punitive demolitions of the houses of terrorists. 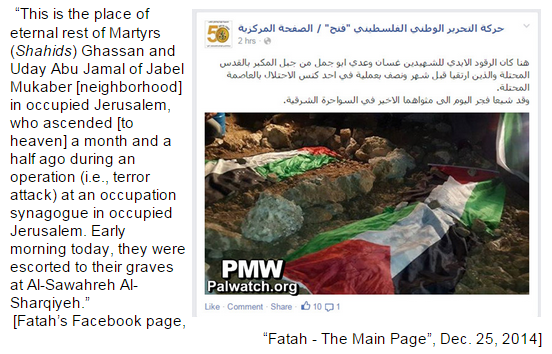 Ghassan and Uday Abu Jamal in fact murdered six Israelis in their attack on the synagogue in Har Nof – not four as Coomarasamy inaccurately states. Coomarasamy’s final sentence in that introduction clearly leads listeners to believe that Muawiya Abu Jamal’s house was deliberately – and unjustifiably – demolished and his interviewee’s account supports that allegation. Let’s take a closer look at the facts behind that portrayal. The demolition orders for the houses of Ghassan and Uday Abu Jamal were issued in November 2014 and the family exercised its right of appeal, leading to a temporary court injunction on the order. The High Court of Justice eventually rejected the appeal. Contrary to the impression given in this item, the order on Uday Abu Jamal’s house was not carried out at the same time as that on the house of his cousin and explosives were not used when, on July 1st 2015, the house was sealed. On October 6th 2015 the demolition order on the house of Ghassan Abu Jamal was carried out. What is not clarified by the interviewee is that his own house is situated next door to that of his brother and in the same building as the apartments of additional members of the family. Whilst unintentional damage did apparently occur to those adjacent structures during the demolition process, James Coomarasamy’s inference that Muawiya Abu Jamal’s house was intentionally demolished despite his “never [having] been investigated in connection with that crime” is inaccurate and materially misleading. “…”something normal which could be expected from anyone who is brave and has a feeling of belonging to his people and Islam. “This act was carried out because of the pressure placed on the Palestinian people by the Israeli occupation government in Jerusalem, as well as the continued acts of aggression against al-Aqsa,” he continued. Neither are audiences told about the wider Abu Jamal family’s approach to the terror attack at the Synagogue – including Uday’s father’s claim that “this is a religious war” and his mother’s praise for the attackers – or about the reaction from broader Palestinian society. Listeners are hence left with the highly questionable take away message that the only possible and relevant background to Alaa Abu Jamal’s actions was the demolition of his relative’s house. On October 24th a sixth victim of the Har Nof terror attack succumbed to wounds sustained eleven months earlier. The death of Rabbi Haim Rothman did not receive any BBC coverage despite the incident having been widely reported by the corporation at the time. However, when fatal attacks took place in France, Kuwait and Tunisia on the same day in late June 2015, BBC coverage did define those attacks as terrorism. In July 2015 BBC Watch submitted a complaint on the topic of inconsistency in the corporation’s use of the word terror. In BBC coverage of the terror attacks which took place in Tunisia, Kuwait and France on June 26th 2015 the word terror was rightly and appropriately used on a variety of BBC platforms including BBC television news and social media. However, in coverage of terrorism against Israeli civilians in general – and the attack in a synagogue in the Har Nof area of Jerusalem in November 2014 in particular – the BBC refrains from using the word terror except when quoting others. We were of course unable to understand why the BBC does not “believe the Har Nof murders are comparable to the recent attacks in Tunisia and Kuwait” or in what way those stories are “very different” and so we submitted a further complaint asking for clarification of that point. That response obviously does nothing to clarify the grounds upon which the BBC’s claim that terrorism against Israeli civilians is “very different” from terrorism against British holidaymakers in Tunisia or against worshippers in a mosque in Kuwait is based. We can however discern that the BBC has a two-tier system for reporting acts of terror which clearly contradicts its own editorial guidelines on that issue. The fact that the BBC is obviously not prepared to engage in discussion of this issue is particularly unfortunate given that its policy of refusal to describe the murders of Israelis as terrorism provides ample evidence of “value judgements” made on the basis of “a political position” which do indeed call into question its impartiality. Whilst the BBC apparently believes that is not a “significant issue”, its funding public may of course believe otherwise. BBC reporting on the terror attack at the synagogue in the Har Nof neighbourhood of Jerusalem in November 2014 included numerous references to a statement issued by the PA’s president Mahmoud Abbas condemning the attack. However, no BBC coverage whatsoever was given to the conflicting messaging in the form of glorification of the terrorist attack which came at the same time from Abbas’ own Fatah party, from Fatah MPs and from Abbas’ advisor. The BBC has also refrained from reporting the fact that both Abbas’ party Fatah and the PA’s official news agency have more recently glorified the two terrorists who carried out the attack as ‘martyrs’ with Fatah claiming that it took place “at an occupation synagogue in occupied Jerusalem”. The way in which journalists choose to frame a story obviously influences the way in which it is perceived and understood by their audiences and the BBC’s selective representation of the president of the Palestinian Authority disconnects him from the organization he heads, including his own political party. Mahmoud Abbas does not of course operate in a vacuum: now long since unable to claim that his hold on power derives from any elected mandate, his position and title depend upon support from those around him. The fact that the Palestinian people are consistently exposed to incitement and glorification of terrorism from official sources such as Fatah and the PA which are headed by Mahmoud Abbas is very relevant context in a story to which the BBC devotes a considerable amount of column space and air time. That context, however, is studiously withheld from BBC audiences by means of journalistic framing. Were officials from a British political party to engage in repeated incitement and glorification of violent acts against a specific group of people, the BBC would be highly unlikely to adopt a policy of refraining from reporting on the topic and it certainly would not give that party’s leader a free pass by negating his or her responsibility for the actions of party officials. When it comes to the Palestinian Authority and Fatah, however, the BBC has glaringly different standards which actively prevent its audiences from being able to reach informed opinions on one of the BBC’s most promoted stories. The BBC’s coverage of the terror attack in the Jerusalem neighbourhood of Har Nof on November 18th provides us with an opportunity to take a closer look at how the corporation framed this story across a variety of platforms. Below is a sample of BBC coverage: obviously it does not include all of the content broadcast across the range of BBC platforms on the two days upon which the story was run. One outstanding – although predictable – feature of the BBC’s coverage is that despite the fact that the core story was about a terror attack perpetrated on the congregation of a synagogue, in all of the above reports the word terror and its derivatives were never used directly by the BBC. References to terrorism came only in the form of quotes from Israeli officials (placed in inverted commas by the BBC), from Israeli interviewees or from the US Secretary of State in the filmed report of his statement to the press. Another remarkable fact is that in seven of the above reports and despite the existence of a pathologist’s report, the BBC nevertheless amplified or allowed the amplification of baseless Palestinian claims that a bus driver who committed suicide the day before the terror attack took place had been murdered by Israelis and presented that as a background factor for the attack. On the day of the attack itself the BBC saw fit to broadcast interviews with Palestinian officials from several factions – Ghazi Hamad from Hamas, Mustafa Barghouti from the PNI and Hussam Zomlot from Fatah – all of whom were given free rein to promote falsehoods and propaganda, including claims of “attacks” on the Al Aqsa Mosque by Israelis. The terror attack was presented across the board as being the result of “rising tensions” between Israelis and Palestinians and those tensions were attributed by the BBC to a variety of factors, with more than one usually proffered in each report and some factors emphasized multiple times in a particular item. Two of the reports suggested that tensions could be explained by “discrimination” against Palestinian residents of Jerusalem and the issue of their right to Israeli citizenship was inaccurately represented. In three reports audiences were told that rising tensions were the result of “a cycle of violence” which, according to the BBC, began with the kidnappings and murders of three Israeli teenagers in June (not stated by the BBC as having been carried out by a Hamas cell) and the later murder of a Palestinian teenager from Shuafat. On five occasions tensions were attributed to the fact that no peace negotiations are currently underway and six reports cited the Palestinian death toll in the summer conflict between Israel and Hamas as a contributing factor but with no information provided to audiences with regard to Hamas’ instigation of that conflict or its strategies – such as the use of human shields – which contributed to the civilian death toll. The campaign by some Israelis for equal rights of worship for non-Muslims on Temple Mount was cited on ten occasions as causing “tensions” but the BBC elected not to explore the topic of why that should be the case. On five occasions Temple Mount was described by the BBC as a “disputed site” and viewers of BBC television news were even told by Jeremy Bowen that Palestinians are “enraged” by “fears about the future of Aqsa Mosque”, with no attempt to put those “fears” in their correct and factual context. But the factor most frequently promoted as a cause of “tensions” which purportedly led to the terror attack was what the BBC termed “settlements” or “settler homes”, with that factor being cited on eleven occasions and the district of Silwan once again being specifically named in two reports. Clearly most of the factors presented were framed as Israeli actions. The overall impression received by audiences therefore was that the “tensions” which lead to Palestinian terror attacks against Israelis are Palestinian reaction to Israeli action. 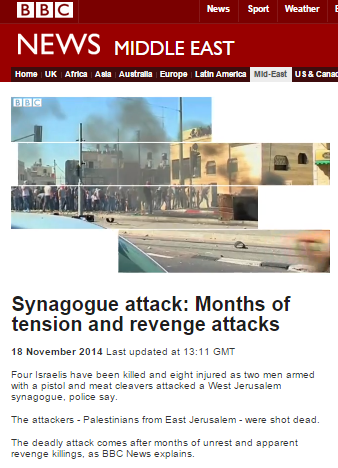 Another interesting aspect of the BBC’s framing of this story relates to the issue of Palestinian incitement. That factor was mentioned directly in two reports (John Kerry’s statement to the press and the interview with Mark Regev), but not by BBC correspondents. In two additional reports the BBC quoted the Israeli prime minister on the issue of Palestinian incitement. Incitement coming directly from the president of the Palestinian Authority was downplayed and dismissed by Jeremy Bowen and Tim Franks. In the BBC Radio 4 programme ‘PM’ listeners heard Yolande Knell paraphrase a supposed Palestinian claim that “Israel is also inciting the violence”. As has been noted here on numerous occasions, BBC audiences have not been informed at all about incitement and glorification of terrorism on the part of PA and Fatah officials (see recent examples here, here and here) and official Palestinian Authority media and institutions (see recent examples here, here, here, here and here). The sole reference to the issue of incitement to appear on the BBC News website in recent months has been an article by BBC Trending titled “The Palestinians calling for the ‘car uprising’” which appeared on November 13th and related to a social media campaign rather than to incitement from official PA sources. So, whilst BBC audiences were repeatedly told that the “rising tensions” which supposedly led to the terror attack in Har Nof can be attributed to a variety of factors which are mostly – according to the BBC’s portrayal – attributable to Israeli actions, they remained completely ignorant on the issue of the crucial factor of the atmosphere being engineered by the Palestinian Authority and its main party Fatah – also headed by Mahmoud Abbas. That glaring and continuing omission in BBC coverage can only be attributed to a politically motivated narrative being allowed to trump the corporation’s public purpose remit. After a conversation with Cardinal Vincent Nichols in which the professed subject matter was not ‘explored’, Crawley (at 40:34) moves on to his next guest. The conversation which took place in the Radio 4 programme is therefore best taken in the context of Wendy Pullan’s obvious political motivations. They, however, were not revealed to the programme’s listeners – in breach of BBC Editorial Guidelines on impartiality. The conversation ends there, but obviously the take away message for audiences is that there is no need to worry about a religious war in the context of the Arab-Israeli conflict. That clearly erroneous conclusion ignores both history and current events, as Dr Jonathan Spyer noted in a recent article well worth reading in full. “An oft-repeated sentiment currently doing the rounds in discussions of the Israeli-Palestinian issue is that it is imperative that the conflict not become a “religious” one. This sentiment, guaranteed to set heads nodding in polite, liberal company, stands out even within the very crowded and competitive field of ridiculous expressions of historical ignorance found in discussion of the Israeli-Palestinian issue. This sentiment is connected to the recent wave of terror attacks in Jerusalem, which are the result of Palestinian claims that Israel is seeking to alter the “status quo” at the Temple Mount. As this theory goes, up until now this conflict had mainly been about competing claims of land ownership and sovereignty, but it is now in danger of becoming about “religion,” and hence turning even more intractable. So this must be prevented. 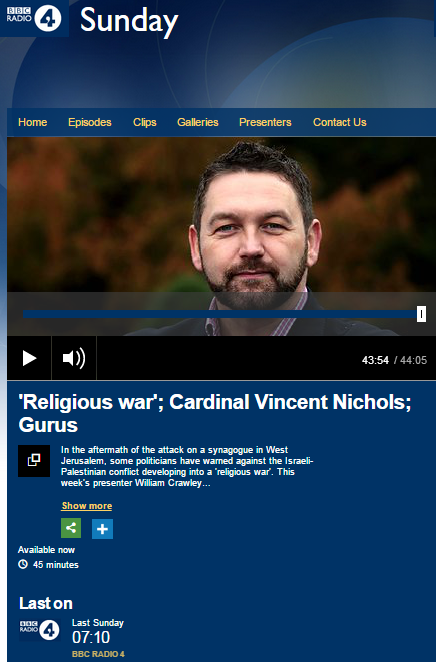 So why did a religious affairs programme on BBC Radio 4 seek to brush aside the veteran religious component in the Arab-Israeli conflict? Well, clearly one answer to that may be that the promotion of a ‘black and white’ political narrative of the kind advanced by Dr Pullan and her colleagues becomes significantly more complicated if Western audiences are informed of the conflict’s religious dimensions. 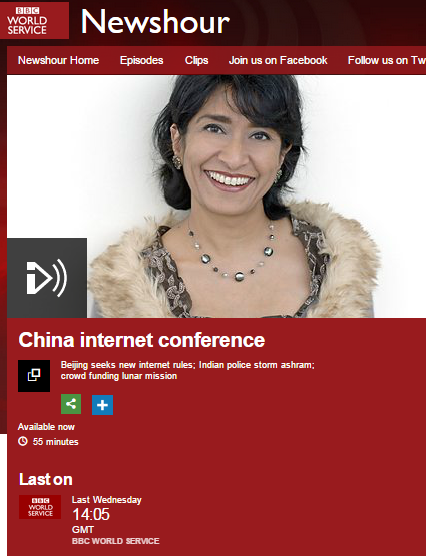 On November 19th – the day following the terror attack in the Kehilat Ya’akov Synagogue in Jerusalem – the earlier edition of the BBC World Service radio programme ‘Newshour’ included an item by the Jerusalem Bureau’s Kevin Connolly (available here from 14:00) which is interesting because it was introduced by presenter Razia Iqbal as a reflection “on the history of this contested city” and hence provides some insight into the accepted BBC narrative on Jerusalem in general, as well as the one being promoted with regard to the current surge in violence and terror attacks. If at this stage listeners anticipated finally hearing some BBC reporting on how the topic of Temple Mount is used by groups ranging from Salafist Jihadists, the Northern Islamic Movement, Hamas and the Muslim Brotherhood through to the Palestinian Authority and Fatah to “manipulate fear” for political benefit, they would be sorely disappointed yet again. Instead, Connolly’s report turned to a very tepid and euphemistic account of the 1929 Arab riots which, like the recent Radio 4 programme on the subject of the Hebron massacre, erases the topic of Arab incitement. Why Connolly felt the need to describe “off the record” statements from the Israeli government is unclear: identical statements clearly explaining the government’s position have been made publicly on numerous occasions. But of course what is really interesting about both Connolly’s item and the BBC’s treatment in general of this topic is that it has completely avoided any exploration of why the issue of equal rights of worship for members of all religions to whom that site is holy should raise such opposition and be considered so incendiary in the 21st century. Once again, BBC audiences are presented with a report which avoids any serious reporting on the contribution of incitement, conspiracy theories and glorification of terrorism by Palestinian leaders and official sources to the recent surge of violence and terrorism in Israel.